It is a landscape which seems to take in all the world. Low in the foreground an arched bridge spans a lazily meandering river. The river, golden in the hazy light, flows leisurely down from a series of high lakes that nestle in the shadows of the surrounding mist-shrouded peaks. This monumental landscape (below), which seems newly-emerged from the very act of creation in the morning of the world, might appear familiar to you. It might perhaps give you the feeling that you have seen it somewhere before, but you cannot quite place where. And yet I guarantee that you have not; certainly not as you are seeing it here. Well, now you have scrolled down, and have discovered (if you have not guessed already) that this epic landscape is in fact the background to that ultimate icon of art: Leonardo da Vinci's Mona Lisa. But it is the background as it has never before been seen. This weblog having something of an off-center focus, I'm going to overlook the lady herself, because it is this background landscape which has fascinated me for many years. Is it really possible that the most overly-familiar image in the whole of art still can yield a secret or two? Well, apparently; yes it is. 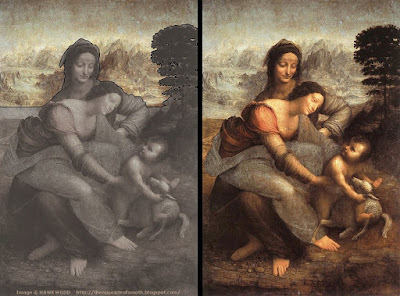 Because while studying a print of Leonardo's masterpiece (and which was, apparently, his own favorite among his works), it suddenly occured to me that if the two sides of the painting were joined together, then the landscape on either side would actually connect to form a whole, and a second landscape not normally visible would appear. So I digitally stitched together the two opposite sides of the painting (above). The match was remarkably close - more so, in fact, than I had expected. 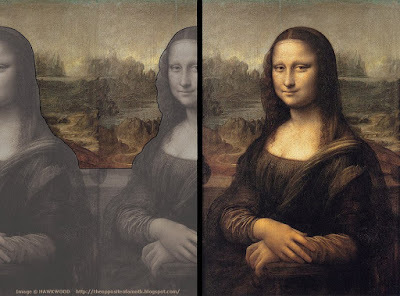 By using a digital technique known as cloning, I could use the master's own brushwork to repair the central join, and also to erase the portions of the portrait which intruded into my frame. It's a somewhat finicky process, but once it was completed, I was looking at the background to the Mona Lisa as a landscape in its own right. Now, the question that you're asking, of course, is: did Leonardo intentionally plan the landscape to wrap around in this way? Honestly, I have no idea, although I would answer: probably not. But his works are so full of tricks and secrets (they made Dan Brown's bank manager smile contentedly, after all) that in Leonardo's mysterious world, anything seems potentially possible. And even were it to be down to simple coincidence, then it's still an intriguing one. 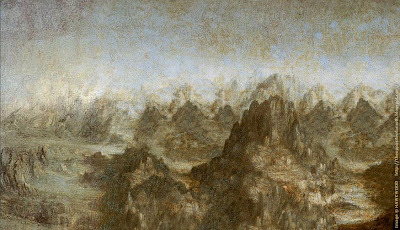 Seen in this way, in all its primeval grandeur, Leonardo's background landscape rather reminds me of those early Chinese landscape masterpieces which, due to their scroll format, present us with similarly grand vistas. The artist Xu Daoning (Hsu Tao-ning) carried these visions of vastness to their ultimate expression (above). By painting his landscape on a roll-out scroll, he created a scene too monumental to take in at once (click on the image to view the effect - the scroll would have been unrolled for viewing from right to left), for his scroll is almost 3 meters (9½ feet) long. The eye travels along the length of the panoramic composition as it would when viewing nature itself. The fishermen in their boats (the detail, above), anonymously distant, add a brief human element, but in the overall scale of the artist's composition they are easily swallowed up among the surrounding rivers and peaks which dwarf them. With these awesome Chinese landscapes, unlike with Western art's Leonardo, there never were any figures in the foreground. The landscapes were the subject. 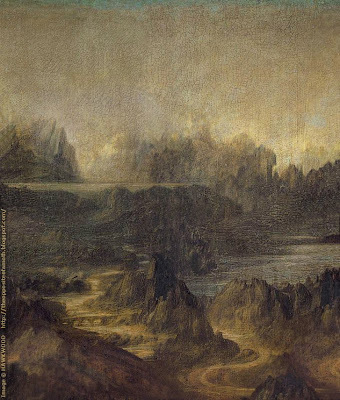 So would it be possible to view any more of these landscapes by Leonardo without their intervening foreground figures? The Virgin and Child with Saint Anne (above) has a similar landscape to the Mona Lisa which is equally monumental in its space and vastness. Without this time wrapping it around itself, but still by using the same cloning technique to erase the foreground figures, I set to work, and the landscape emerged. My cloned version of this second background (above) produced another vista of mist-shrouded peaks and deep river valleys. But unlike the Chinese visions of four to five centuries earlier, Leonardo's 16th-century European world was not the age for such landscapes to be treated as subjects in their own right. My digital treatments here of his background landscapes therefore cheat time as well as his own creative reality. However far the artist's towering outside-the-box genius could reach, it still could not encompass the idea, which the art of Song Dynasty China had long embraced, that such landscapes not only could be a worthy subject in their own right, but could, by their expressive power, reflect something of the human condition back to their viewers (by Wu Yuan-Chih, below). But neither Leonardo's background landscapes nor the imposing panoramas of the Song were exact depictions of existing places, neither were they intended to be such. Just as these early Chinese landscapes were based upon the views seen in such regions as the Huangshan Mountains, Leonardo's landscapes were based upon views of the southern Alps, without quite being either. They are landscapes with a plus factor: places familiar, yet unknown, remaining essentially the unique inner visions of the artists who created them. Chinese Art: The Five Dynasties and Northern Sung, by Jean A. Keim. Methuen and Co., 1962. Very interesting! Nice to see I'm not the only one that's been fascinated with the rather "other-worldly" landscapes that DaVinci painted. You have a beautiful blog, and I'm enjoying it immensely. I'm glad that you're enjoying what you find here, Katie! Yes, the backgrounds of paintings often turn out to be as remarkable as what those paintings are 'about'. Thank you for your comment.